This is a "vintage" sign that is carved in stone. There are others: for instance, Dept of Water Supply Gas and Electricity, a block away on West Broadway between Beach and Franklin streets. This block of Beach Street (between Varick and Hudson) is now (2002) called Ericsson Place, but it was Beach Street in the 1890s when this building was constructed for the Merchants Refrigerating and Ice Manufacturing Co.
Merchants were warehousemen, offering general as well as cold and freezing storage. They had offices on Chambers Street and a number of warehouses scattered around the downtown New York area, including this building, which runs through the block to 35-37 North Moore St. The facade on North Moore has an identical stone-carved sign, differing only in the numerals. 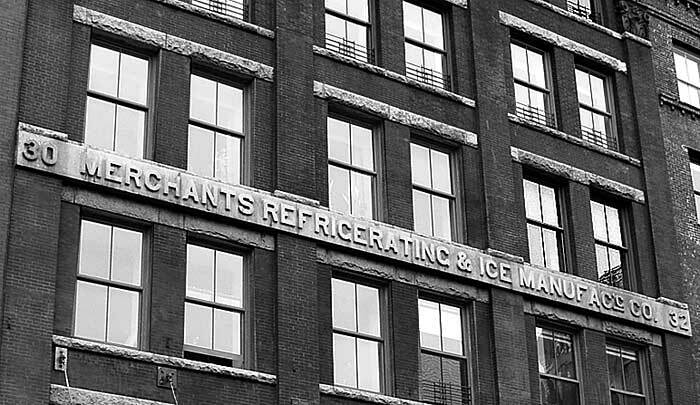 Merchants shortened its name from "Merchants Refrigerating and Ice Manufacturing Co." to "Merchants Refrigerating Co." in 1896. So the sign was probably part of the original building construction, approximately 1893. The sign is also interesting for its abbreviation of "manufacturing" to "manufacg". I'm not sure I have ever seen this form before. It's almost as if they were writing the full word but ran out of space because the building wasn't wide enough! Somewhere around 1910 this building no longer appears in Merchants' list of warehouses. Instead, the building next door at 22-28 Beach St. (nicknamed the Ice House) with entrance also on North Moore (no. 27) took its place. This change was described in Cold Storage and Ice Trade Journal, Nov. 1906, "New York City. - The Merchants' Refrigerating Company has completed its new cold stores on North Moore and Beach streets. The new buildings adjoin the former North Moore street houses, occupying a plot 54 feet on North Moore street and running back 180 feet to Beach street and having a frontage on that street of 108 feet. The new addition is a handsome yellow brick, steel and concrete structure, ten stories high, with two floors below ground, and it is absolutely fireproof throughout." The founders of Merchants' Refrigerating were the brothers, William Wills (ca.1842-?) and James Wills (1849-1910). Trow's New York City Directory for 1890 listed "Wills Brothers Co., warehousemen, cold & general storage" with offices at 161 Chambers St. and warehouses at 161 and 163 Chambers, 143 Reade St., 393, 395 and 397 Greenwich St. and 62 Beach St. Prior to that time directories indicate that William Wills was in the storage business from around 1883, and James Wills in the insurance business. The brothers were recorded in the 1880 U. S. Census living at 228 W. 22nd St. with their widowed mother, Lucy Wills, age 69. At that time William Wills gave his occupation as "Bottler of Liquors," and James Wills was recorded as the secretary of an insurance company. An account of a fire at 161-163 Chambers St. in 1897 (New York Times, 8 May 1897) included, "The building threatened composes 161-163 Chambers Street and 142-144 Reade Street. … Above the street floor the entire building is occupied by the Merchants' Refrigerating Company for cold storage. There is no apparatus for freezing in the building, and nothing chemical is used in maintaining the low temperature necessary. All the machinery in use is in 143 Reade Street, where brine reduced to the required temperature is pumped through pipes to the buildings 141, 149, 142, 144, 148, 150, and 152 Reade Street and 161 and 163 Chambers Street, operated by William Wills for the Merchants' Refrigerating Company for cold storage." This ad for Merchants' Refrigerating Company of New York appeared in the publication Butchers' Advocate, vol. 23, no. 14, 18 August 1897. Williams Wills is identified as manager, and James Wills as secretary. Both 30-32 Beach St. and 35-37 N. Moore St. are listed as warehouses. "Examine our freezers!" A similar ad appeared 25 years later in Oct. 1922. James Wills appeared in the 1900 U. S. Census living at 1700 Broadway (corner of 53rd St.) with two sisters, Sarah Wills and Marrieta Wills (Mrs. J. R. Leghart). In the same year William Wills lived at the Beresford Apartments, 1 W. 81st St. (corner of Central Park West). The census recorded all of his information as "unknown" (including his first name) except occupation, which was "Storage." He was married but his wife's name was "unknown." On his death in 1910 James Wills received the following obituary in the Cold Storage and Ice Trade Journal, April, 1910, p. 76, "DEATH OF JAMES WILLS On Tuesday, March 29, the trade was greatly shocked to learn that James Wills, one of its most prominent members, had died suddenly at his residence, 332 West 101st Street, New York City; heart disease being assigned as the cause. Mr. Wills was secretary and treasurer of the Merchants' Refrigerating Companies of New York City and Jersey City, and was known from coast to coast as one of the "old guard" in warehouse circles. His sudden taking off will, therefore, be regretted by not only his intimate business associates, but by those who knew him as a conscientious worker and defender of the cold storage warehousing business. Mr. Wills was about 65 years of age, and was born and educated in New York City. His first attentions were devoted to the insurance business, and at one time he occupied the position of assistant secretary of the Sterling Fire Insurance Company. He then became manager of the insurance department for R. J. Dean & Co. of New York, at that time a prominent warehousing concern. In 1889 he organized with his brother, William, the Wills Brothers Company, which was later consolidated with the Merchants' Refrigerating Company. In 1901 the Merchants' Refrigerating Company of New-Jersey was organized, and Mr. Wills immediately assumed charge of the overseeing of the building and equipment of the plant. In this phase of the work he immediately excelled, devoting a care and attention to the details which quickly won for him recognition as one of the foremost refrigerating experts in the country. This recognition found voice in his election to the vice-presidency of The American Society of Refrigerating Engineers, one of whose members he had been since its inception. Aside from his business interests, Mr. Wills was prominent socially and a well-known figure in club circles. He was a member of the New York Athletic Club, New York Yacht Club, Salmagundi Club, Union League Club, Nassau Boat Club, and was also a life Mason of the Kane Lodge. He was a bachelor and lived with his two sisters. His sisters and his brother, William, president of the Merchants' Refrigerating Company, survive him. The funeral was held at his residence on Thursday, March 31, where the trade gathered to do last homage to one of its foremost representatives." This portrait of William Wills appeared in Moses King's Notable New Yorkers of 1896-1899 (1899). On William Wills' retirement as president of Merchants' Refrigerating, the following account appeared in the American Warehousemen's Association's Bulletin, No. 139. Sept. 1911, pp. 258-260, "Changes in Merchants' Refrigeration Company. - We learn from the New York Produce Review of August 9th that: [all below in quotes] At a meeting of the board of directors of the Merchants' Refrigerating Company of New York (which company has recently acquired the Jersey City business and property of the Merchants' Refrigerating Co. of New Jersey) held August 8th, the resignation of William Wills, which had been presented some three months ago, was accepted, with great regret, to take effect on September 1st. Mr. Wills was elected to a newly created office to be known as chairman of the board of directors. ... The retirement of William Wills from active management of the Merchants Refrigerating Co., has been contemplated by Mr. Wills for two years past. It was delayed last year by the death of his brother, James Wills, who occupied an important place in the official management. William Wills' active connection with the cold storage interests of New York has been coincident with the inception and development of cold storage as a public institution. About 30 years ago, when public cold storage was in its earliest infancy, William Wills entered the business as a partner of R. J. Dean, the firm operating an ice-cooled plant at Greenwich and Beach streets. Seven years later, in 1889, the firm of Wills Bros. was organized at 161 and 163 Chambers street and 143 Reade street. Some improvements in the methods of applying ice to refrigeration had been made during this time and shortly thereafter Wills Bros. began to equip their plants with the then newly devised methods of mechanical refrigeration. While these changes were still in progress in 1892 the Merchants' Refrigerating Company of New York was organized to take over and extend the business of Wills Bros., William Wills becoming the manager and later president of the new company. Mr. Wills also served continuously as president of the Merchants' Refrigerating Co. of New Jersey, now consolidated with the New York Company... "
Both William Wills and James Wills worked for R. J. Dean & Co. before forming their own storage company. R. J. Dean & Co. were a banking and warehouse business founded by Robert John Dean (1848-1903). In both the 1870 and 1880 U. S. Census reports Robert J. Dean appeared as a grocer. But in the early 1880s he entered the banking and storage businesses. In 1886 R. J. Dean & Co. were described as follows in The New York Stock Exchange: Banks, Bankers, Business Houses, and Moneyed Institutions of the Great Metropolis of the United States, "R. J. Dean & Co., Bankers and Warehousemen, No.802 Greenwich Street, corner Chambers. — Among the leading commercial and financial houses of the great city of New York, special mention should be made in this historical review of the widely known and respected firm of Messrs. R. J. Dean & Co., bankers and warehousemen, which has always held a first-class position, and now stands as one of the most prominent and reliable business establishments in the metropolis. The headquarters of the firm are located at No. 302 Greenwich Street, near Chambers Street, and the following are some of the bonded, free, and free cold warehouses owned and operated by this enterprising house, viz. : Bonded, General, and Cold Warehouses — Nos. 603, 605, and 607 Greenwich Street; Nos. 43, 45, and 47 Clarkson Street; Nos. 90, 92, 94, 96, and 98 Thirteenth Avenue, North River; and Nos. 544,546, 548, and 550 West Fourteenth Street. Free Warehouses — Nos. 164,166,178, and 175 Chambers Street; Nos. 294, 296, 298, 300, 302, 492, 494, 496, 498, 500, 502, 504, and 506 Greenwich Street. Free Cold Warehouses—Nos 90, 92, 94, 96, 98,100, 102, and 104 North Moore Street; Nos. 390, 392, and 894 Greenwich Street, and Nos. 66 and 68 Beach Street. This is the largest warehousing concern in the world, having fifty two stores in the city of New York adapted to the requirements of every variety of goods. ... An important specialty of Messrs. J. R. Dean & Co. is advancing cash on storage receipts of merchandise, their facilities being practically unlimited as to amount. The insurance department of this extensive business is under the able management of Mr. J. Wills, who is thoroughly conversant with every detail and feature of insurance, and customers can always implicitly rely on his ability and integrity. ... The individual members of this copartnership, Messrs. Robert J. Dean and William Wills, have had great experience in this business, and are highly esteemed in mercantile circles for their executive ability..."
An ad for R. J. Dean & Co. appeared in Bradstreet's Weekly, Saturday, 29 May 1886. This ad for Merchants Refrigerating appeared in a publication called the Port of New York Annual, compiled by Alexander R. Smith, 1920. A year later (1921) this ad for Merchants Refrigerating appeared in the New York Central Railroad's Industrial Directory and Shippers' Guide. Frank Alexander Horne (1869-1939), mentioned in the ad as president, received the following obituary notice in the New York Times, 23 March 1939, "Frank A. Horne of 409 Grand Avenue, Brooklyn, president of the Merchants Refrigerating Company, 17 Varick Street, and one of the leading Methodist Episcopal laymen in the United States, died yesterday afternoon in the Methodist Episcopal Hospital, Brooklyn, of which he was president. He was born in Brooklyn seventy years ago. Devoting his entire business career to the refrigerating business, Mr. Horne made himself an authority on the subject and for nine years, 1912-21, was president of the American Institute of Refrigeration. In the World War period he served in Washington for a dollar a year as chairman of the advisory committee of the Food Administration. On several occasions he discussed proposed laws relating to refrigeration before Federal or State legislative committees. In the many years he was associated with the Merchants Refrigerating Company Mr. Horne served as chief clerk, assistant secretary, secretary and treasurer, and, since 1911, as president. He was also a director of the Cruikshank Company and a trustee of the East River Savings Bank. … In 1913 he married Daisalie S. Place, who survives." Frank A. Horne's involvement with Merchants Refrigerating was described as follows in the American Warehousemen's Association's Bulletin, No. 139. Sept. 1911, "Frank A. Horne, the newly elected president of Merchants' Refrigerating Co. of New York has been closely associated with the work and management of the company since its inception. He entered the cold storage business as an employee of Wills Bros. when that company was first organized in 1889 and continued with the Merchants' Refrigerating Company in positions of steadily advancing responsibility. Upon the death of James Wills, Mr. Horne, then assistant secretary, was elected to the office of secretary and treasurer and his peculiar fitness for executive work, based upon a long experience and unusual personal abilities, is now recognized in his election as president of the company."